Trust me on this one. You’ll feel better if you cut your losses. Really. Those unfinished projects of yours are causing you unnecessary stress. It’s a new year. Resolve to end the year with a plan. Either you’re going to finish them and enjoy using them, have a plan for finishing them or you’re going to make them disappear and not feel the least bit guilty about it. The hard thing about unfinished objects (affectionately known as UFOs) is that you’ve already invested a lot either in terms of time or money. But I’m here to tell you that UFOs are the equivalent of creative clutter. They weigh you down. I speak from experience. The quilt shown in the photo above made me feel bad every time I looked at it for the past 10 years. Yeah. That’s right. 10 years! My husband Bill and I made it in 1996 as a folk artsy sort of charm quilt from scraps of fabric we had each accumulated in our lives. 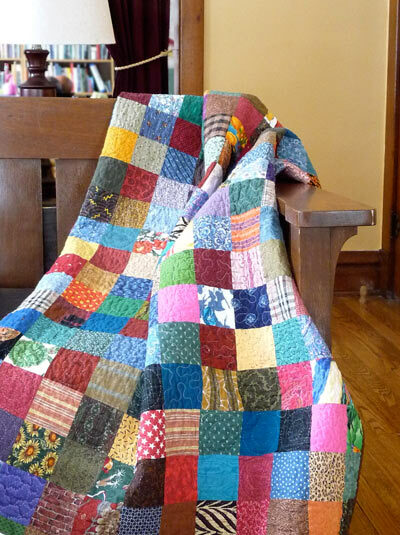 It is the first quilt we made together and thus has a certain sentimental value. The quilt is made from favorite shirts, the fabric from my kitchen in Tokyo, a few treasured pieces of Liberty and charm squares we found on the sale table. We had decided to hand quilt it, even though it is a full-size quilt. In those days we had frequent long road trips and we’d tag team between who was driving and who was quilting. It was the only quilt we were working on and we weren’t in a hurry to finish it. Years later those road trips were no longer necessary, we renovated a 1914 bungalow, started FunQuilts, adopted a child, wrote three books on quilting and suddenly couldn’t rationalize the time to finish quilting it when there were so many other quilts in progress in our lives. We didn’t want to toss it so it just sat in our storage room. Each of us sighed every time we looked at it. Then suddenly I decided that it was the hand quilting that was preventing us from using it and that we just needed to accept that we weren’t going to hand-quilt the last third of it. We just decided to put it on our long-arm machine and quilt the rest of the quilt by machine using the same color thread we had used in the hand quilting. 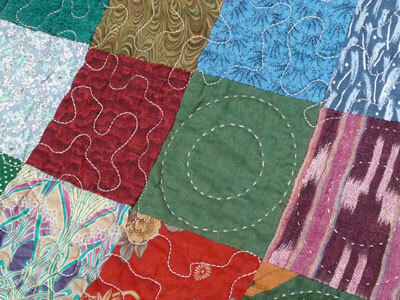 In the end, I like the effect of the two types of quilting. But mostly I like the fact that it’s done and in use. I love not seeing in sitting in a bag our storage room anymore. It was bringing me down and holding me back from starting new personal projects. It just felt like a waste to have all that work in a bag for 10 years. So here’s my advice. Ask yourself honestly if you still like the UFO. Will you enjoy finishing it? Are you excited about finishing it? If not, give it away or finish it as quickly as you can and donate it to a good cause. If you like it but need help with some aspect of it, figure out who you can draft this year to help you. You just want to get the half-done things that don’t bring you joy to look at out of your home. It doesn’t matter how much money or time you spent on it. If it’s not bringing you joy, outta there! The reason this matters is that there are so many other projects that would bring you great joy and they’re waiting for a place in your head and home. You wrote this one for me…….I’ve been cleaning out the sewing room after the Christmas gift sewing frenzy and there’s a pile of UFO’s 2 feet tall! Most are pieced but not quilted tops ranging from mini to throw quilt size. They DO drag me down; I feel I have to finish them before I start something new. I’m following your advice; what I can’t finish in the next 2 weeks will go to a new home! So well put. Love the machine/hand quilting combination. It is as original and meaningful to you as all of the fabric patches are. A few projects started to weigh on my mind lately. For two of them, getting re-started and also changing the scope of them helped. The other one got tossed—no regrets! What an inspiring post. I’m glad you finished the 10 year quilt. It’s so full of memories and now you can use it. I’m off to do exactly this! UFO’s here I come! I have just been going thru this process myself. Will I finish it? Do I want to add more or am I ready to quilt it? Some of what i was saving has been waiting for my skills to catch up. … and some of it just needs to go. I have cleaned out 5 art bins so far and got 8 baby quilt tops out of it.